Wilson Tan, the epitome of a successful Malaysia first top male supermodel with numerous awards winning recognitions was just a regular small town boy from Gerik, Perak, Malaysia. He comes from a humble middle-class family. He worked as chemical engineer about two years after completing his studies in University Science Malaysia (USM). He realized scientific field was not for him when he was 27 and decided to try his hand at modeling which totally turn things around. He started off with zero experience and ventured into this career through support and encouragement of friends and people around him. Wilson is also the living proof of the saying “age is nothing but a number”. Starting his career at the age of 27, it is actually considered too late for a profession with a very short shelf-life like modeling. He achieved the goal that he has set for himself just within four years and from the look of things, there is no stopping for this Malaysian male supermodel. His courage to pursue his dream combined with his good attitude has taken him this far in the industry. 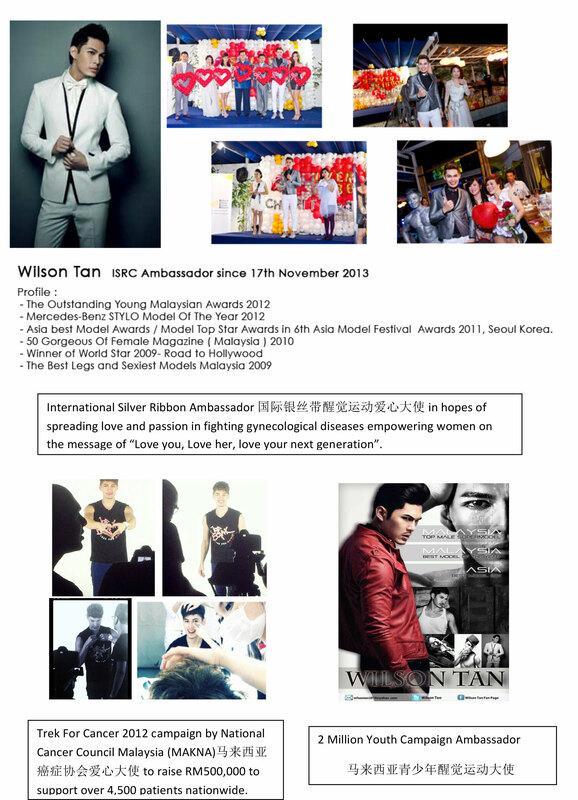 Wilson Tan has won so many recognitions not only locally but internationally as well, such as Asia Best Model / Model Top Star Award (Seoul, Korea) by Asia Model Festival Awards in 2011, Model of the Year 2012 by Mercedes-Benz STYLO Fashion Awards , Malaysia Most Popular Male Face Model Of the Year 2012 by Asia Model Festival Awards, nominated as The Outstanding Young Malaysian for 2012 , 4 medals winners for World Championship of Performing Arts (Los Angeles, Hollywood) in 2009 and “Prestigious Personal Improvement & Accomplishment Award ” in 21th Century Prestigious Brand Awards 2012!! Wilson Tan has proven that he can achieve goals that he set up for himself and his dreams are no longer just dreams instead they are now a reality that he is living in. 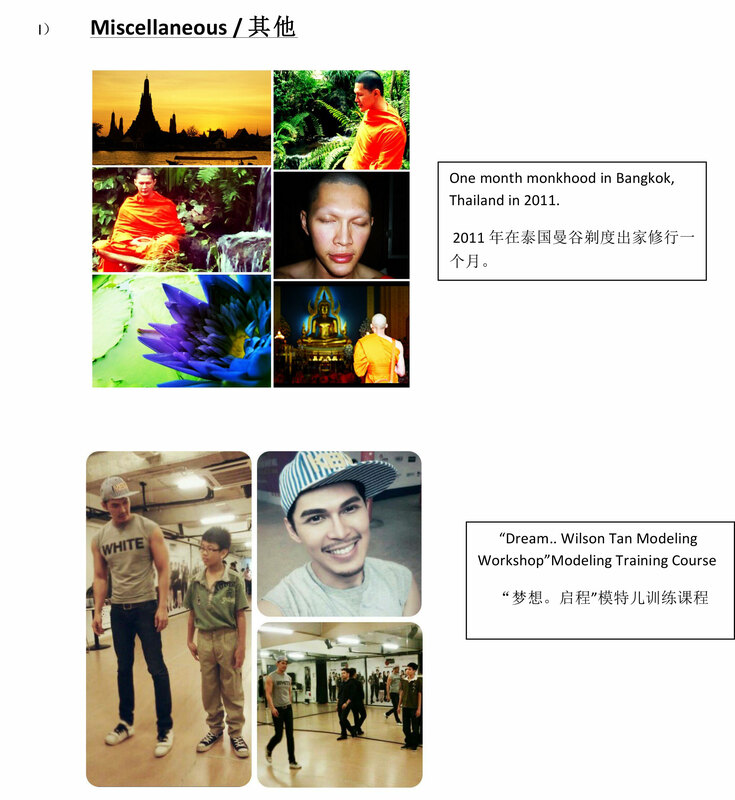 Wilson Tan was awarded Best Asia Model Award / Model Top Star Award at the 6th Asia Model Festival Awards 2011 (AMFA) in Seoul Korea. He was among 12 other participating countries up for the coveted title. It was such a prestigious award ceremony as past winners of the same categories include well-known international artiste like Lee Byung Hun from Korea and Wu Chun from Taiwan. 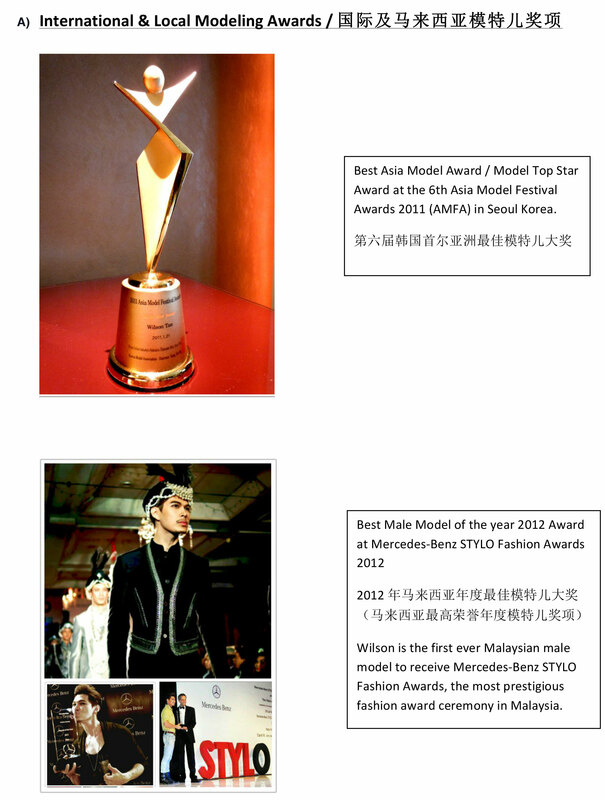 Winning Best Male Model of the year 2012 Award at Mercedes-Benz STYLO Fashion Awards 2012 was very special for Wilson Tan. He was very surprised to win the award as he had never really been recognized locally. Wilson is the first ever Malaysian male model to receive Mercedes-Benz STYLO Fashion Awards, the most prestigious fashion award ceremony in Malaysia. Wilson Tan never failed to get the judges’ attention in each competition that he enters. During Grand Championship of Performing Arts in Hollywood (WCOPA) Los Angeles, USA, he took home four medals from the competition. He was given the highest score for male model category and most potential model which is highly recognized by modelling agencies in the USA. He took home the title Model Industrial Awards 2009 for that competition along with the silver medal for casual and formal wear for male category. 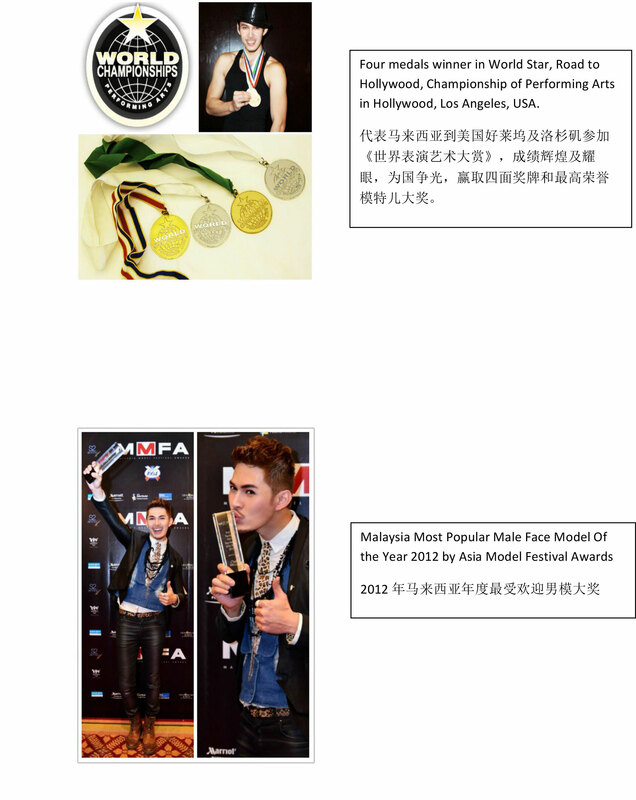 He represented Malaysia after winning Road to Hollywood (Modelling Category). 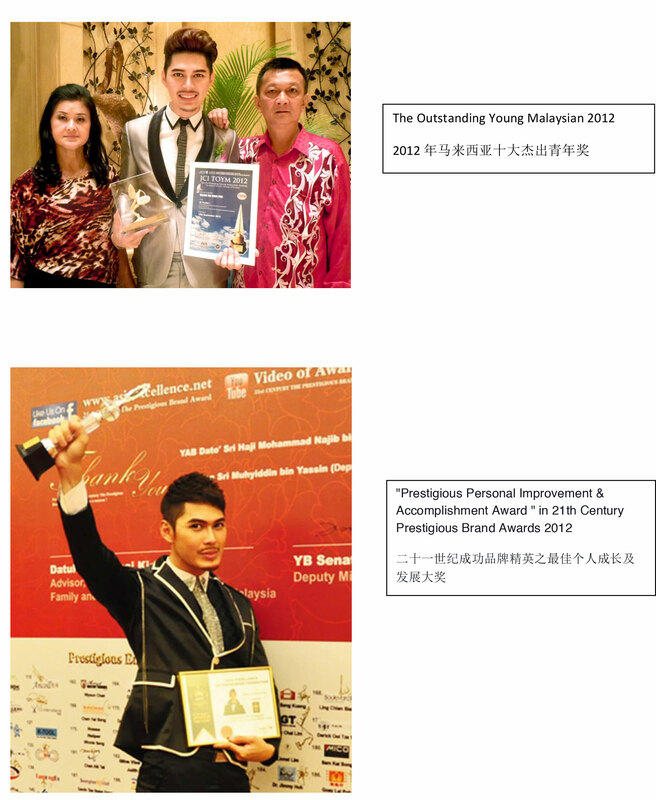 Wilson Tan deserves to be The Outstanding Young Malaysian for 2012 because of his stellar achievement in his chosen field for the past few years. Wilson Tan has built a name for himself from the bottom and climbed all the way up without even once looking down on all the obstacles that he has gone through. Four years is quite a short period of time to achieve what he has achieved so far. 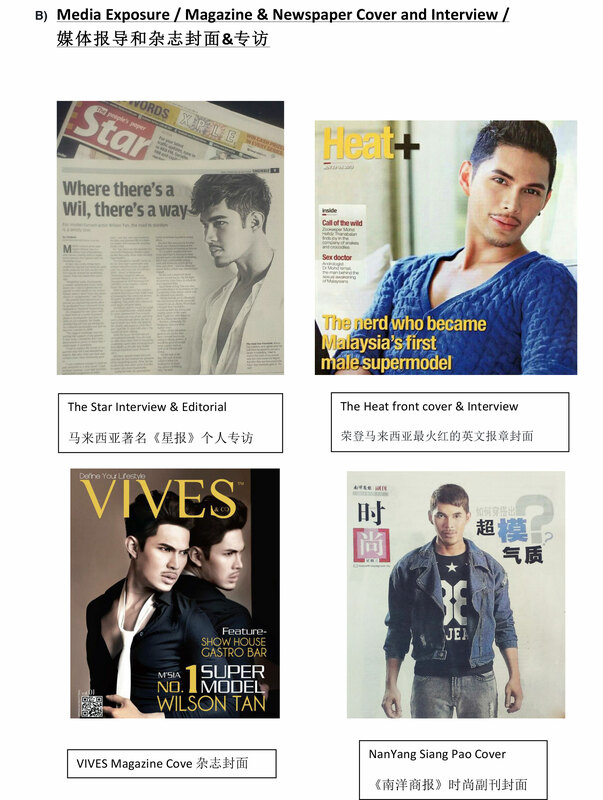 He is the first ever male model to achieve this greatest level of success in Malaysia. To get to where he is right now within the short period of time is almost impossible but he somehow managed to do it. From a humble beginning in the field of engineering he is the living proof that people can do anything that their put their best effort into. Being an internationally acclaimed male supermodel, Wilson Tan has worked so hard and his determination set a really good example for all the youngster out there especially those who have just started in the fashion and modeling industry. 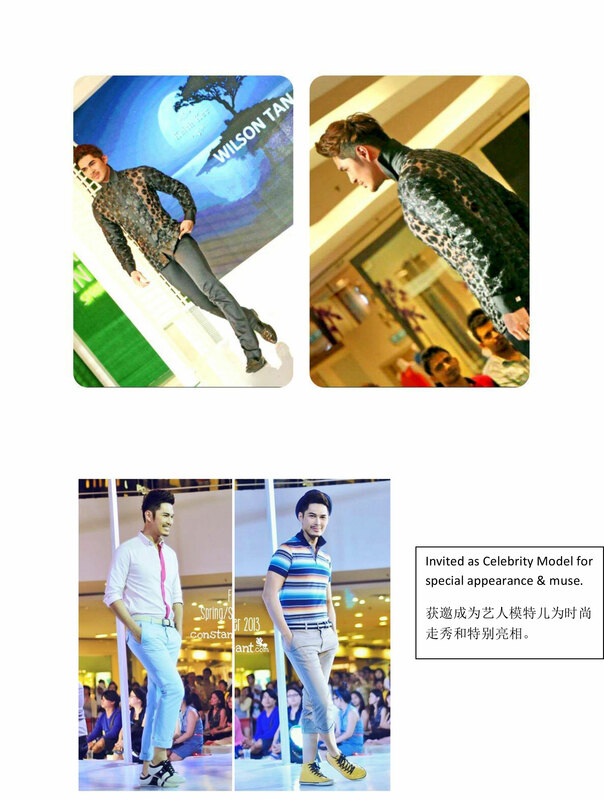 Fast forward after four years, Wilson Tan is now a well-known and prominent face of local fashion and modeling industry. He has done pretty much everything in the industry as a runway model and has appeared in countless magazine cover shoots, TV, radio & newspaper interviews and editorial. He has also starred in so many different television commercials, print ads as well as appointed as brand ambassador for local and international products. Wilson Tan also received a lot of invites to become celebrity judge as well as making celebrity appearances at important events and competitions. There’s no stopping for this supermodel as he has even started to enter several new territories which include training up and coming supermodels and sharing his knowledge in grooming via workshops “Dream… Wilson Tan Modeling Workshop” to help local aspiring models to learn some tips and pointers on modeling, grooming and how to kick start their careers. The participants were also given lessons on public speaking and ethics as well as a makeover. He also walked for Malaysia Fashion Week in London in the same year wearing batik from Kraftangan Malaysia and Malaysian traditional garbs. Chosen as one of the Gorgeous People of Female Magazine Malaysia in 2010, Wilson Tan again represented Malaysia for One Malaysia International Fashion Week held in Washington, D.C, USA also in 2010 to promote Malaysian batik as well as exchanging of cultures. As for fashion show, Wilson has walked for the runways of international fashion houses like Versace, Gucci, DKNY, Georgio Armani, Salvatore Ferragamo and Calvin Klein not only locally but internationally as well. 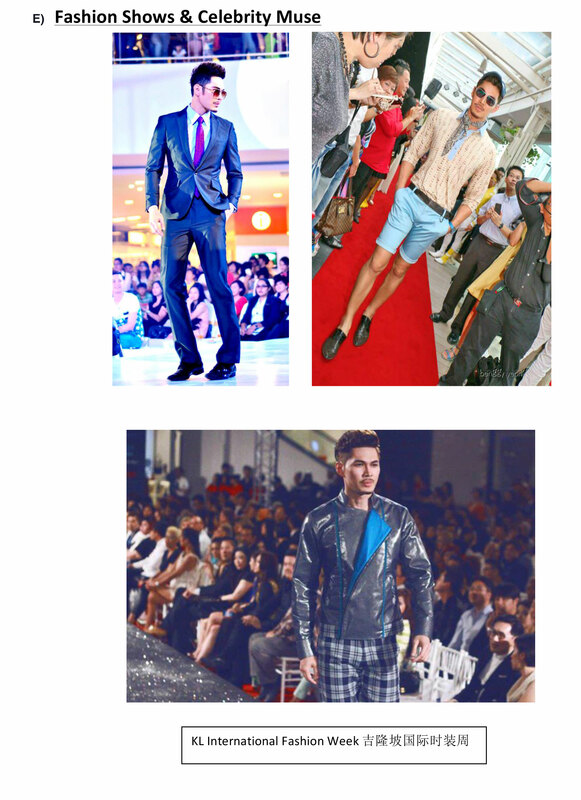 Now Wilson Tan is always ahead of the pack handpicked as designer’s muse as well as closing and opening fashion shows. 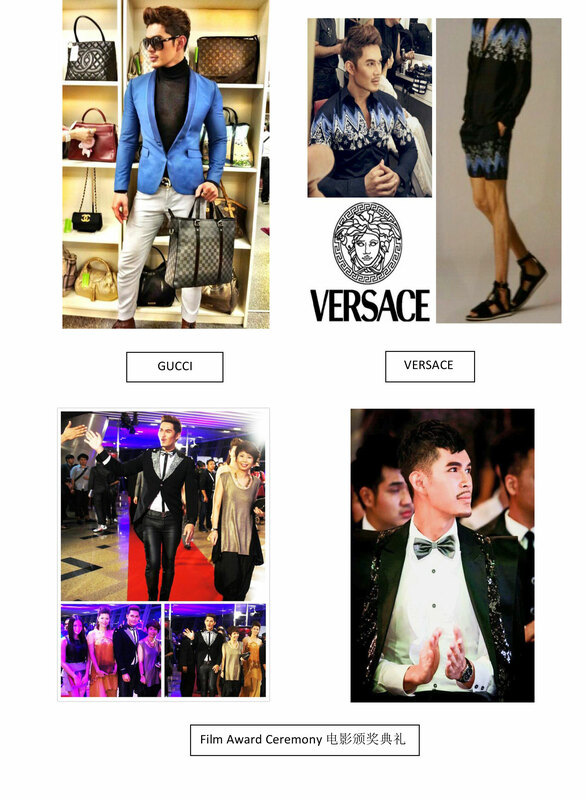 He has also become spokesperson of different brands and products which include Mutated Nation ( France), Bizzy Body ( Hong Kong & Malaysia), Masculine, LILA LACHS Fashion Haute Couture ( Germany ). Wilson went to Bali, Indonesia as he has been selected to be a part of International Islamic Fashion Festival as Indonesian famous designer’s celebrity model muse. He will strut on fashion runway of Australia Fashion week on this coming October 2014 and invited as celebrity judge for Australia Supermodel Of The Year 2014! 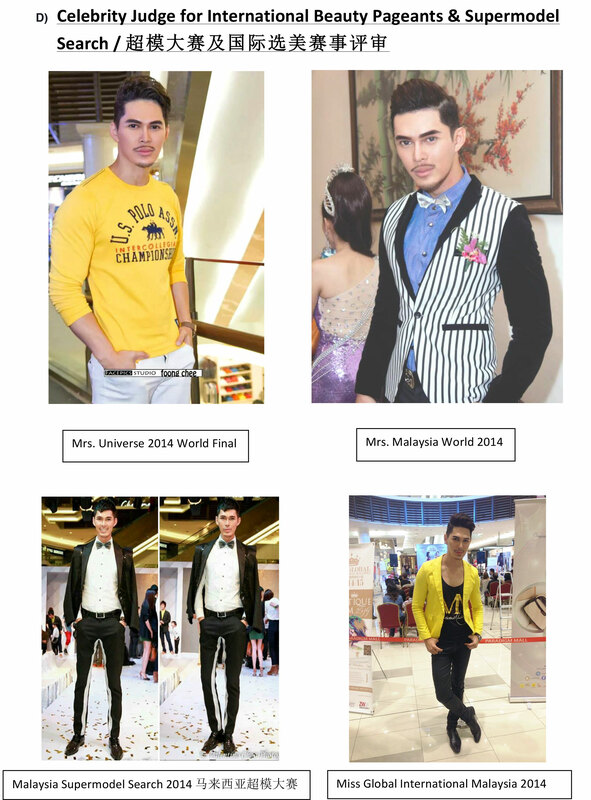 His knowledge and experience in modeling field has also been put to good use by being the celebrity judge for countless international and local beauty pageants/competitions for instance Mrs Universe 2014 World Final, Miss Global International Malaysia 2014, Mrs Malaysia World 2014, Malaysia Supermodel Seach 2014, World Stars Road to Hollywood 2014&2013&2012, Mrs Malaysia Globe 2012, Miss Kebaya 2012 , Miss Muzeum Ambassador Search 2012, OMG! 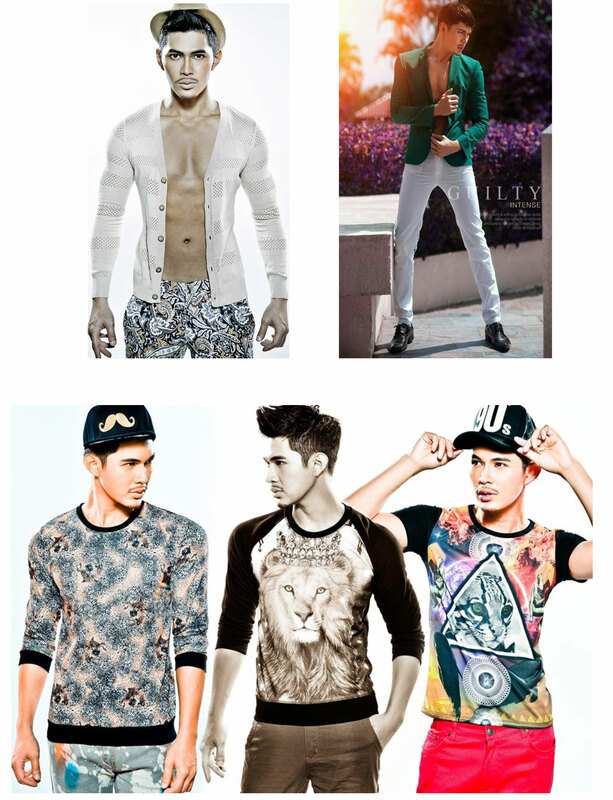 Covershot Gal 2012, Miss Tourism International Beauty Queen 2011, Mr.Uberman 2011, Man Hunk 2011, X Top Model Search 2011, Miss Calendar Model Search 2011, Miss/Mister Malaysia International 2011. After receiving the awards, the fame and limelight were a little bit too much for Wilson to handle. He started losing himself and failed to balance things up. He decided it’s time for a change of attitude and went for a monk-hood to cleanse his inner self. He shed away his glamorous image and shaved his head and eyebrow.It was a whole new experience for Wilson. He had to wake up as early as 4am for the morning chant and survive on alm-food via donation from other people. He had to carry a rice bowl and walk for miles barefoot to get a meal before 12 pm every day. For one month, Wilson led a simple life while experiencing the pain and suffering of the unfortunates. He calmed himself down with a lot of meditations which helped him let go of all the negativity. He has also never forgotten to give back to the society especially in helping the unfortunates as he believes that being a model is more than just looking good in front of the camera. It is very important for him to stay in touch with issues and events surrounding his life. 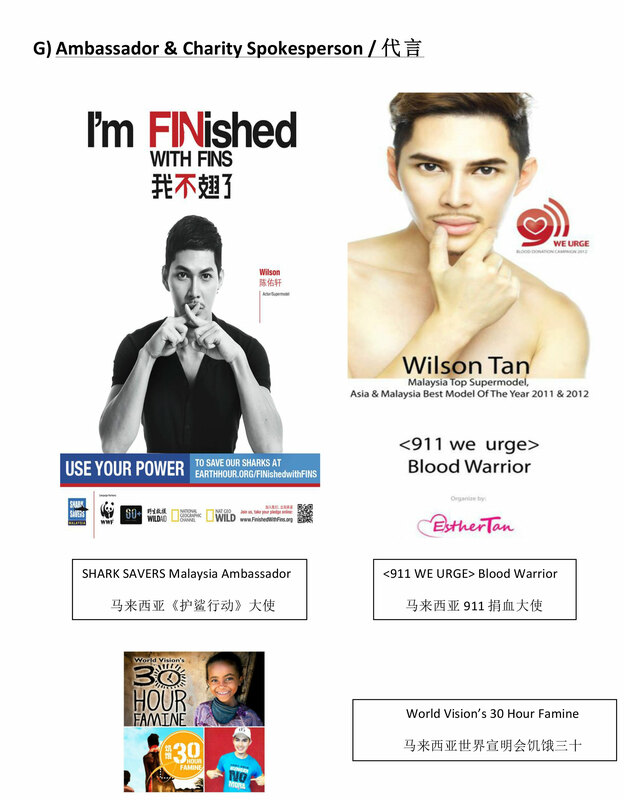 Wilson has also become spokesperson of “ Shark Savers Campaign Malaysia “to raise awareness to the public to reduce the consumption of shark fin soup is called “ Im FINished with FINs”. It is vital to educate those people who are not yet aware of the dangers to sharks caused by the shark fin trade. Wilson also ambassador for “International Silver Ribbon “ in hopes of spreading love and passion in fighting gynecological diseases empowering women on the message of “Love you, Love her, love your next generation”. Throughout his journey in the modeling world, Wilson Tan learned the hard way about caring towards others and how to always do something not only for himself but for others as well. It’s not easy to stay humble in the industry where you are being judged by the way you look and how popular you are compared to the rest but Wilson Tan has managed to stay humble and see his celebrity status as a way to serve others on daily basis. This supermodel also believes that communication is one very important key to success. He always tries to tell the youngsters today about how important it is to always be alert of what’s going on with the environment, society and country as a whole. He thinks a lot of youngsters these days have lost touch with what is really important. He felt very strongly about the issue when he was asked to speak to the youngsters who attended the 2 Million Youth Gathering in Putrajaya. He also talked to the participants and attendees about serious youth related issues like facing obstacles and suicide. He shared his own experience and talked about how it is better to talk things out and seek advice from others. He also reminded the youth about how they can give back to the nation with their contributions regardless big or small which can make a lot of difference in the future. Wilson’s concern over such issues makes him closer to the society as well as his fans. That’s why when Wilson Tan was appointed as one of the celebrity spokespersons for “Khabar Baik Japan”, he jumped immediately into the opportunity. “Khabar Baik Japan” was a cultural exchange program organized to raise fund for tsunami victims in Japan. Held at Tokyo Street Pavilion Kuala Lumpur, Wilson Tan was beyond excited to be a part of the charity and helping people in Japan to get back on their feet again after such devastating disaster. Environmental issues are very close to Wilson Tan’s heart which led him to be involved in a Going Green Campaign in collaboration with Bizzy Body and Malaysian Nature Society. The campaign was aimed at reducing the use of plastic bags and promoting the use of recyclable bags. The proceeds from all the recyclable bags sold went to Malaysian Nature Society funds. This charismatic supermodel has also appeared in a music video for Jom Botak: Trek For Cancer 2012 campaign organized by National Cancer Council Malaysia (MAKNA) which aims to raise RM500,000 to support over 4,500 patients nationwide. It’s a very good cause as RM 9 million is needed every year to financially assist cancer patients in their recovery process. Wilson’s accomplishments in fashion has led to hosting and acting offers. 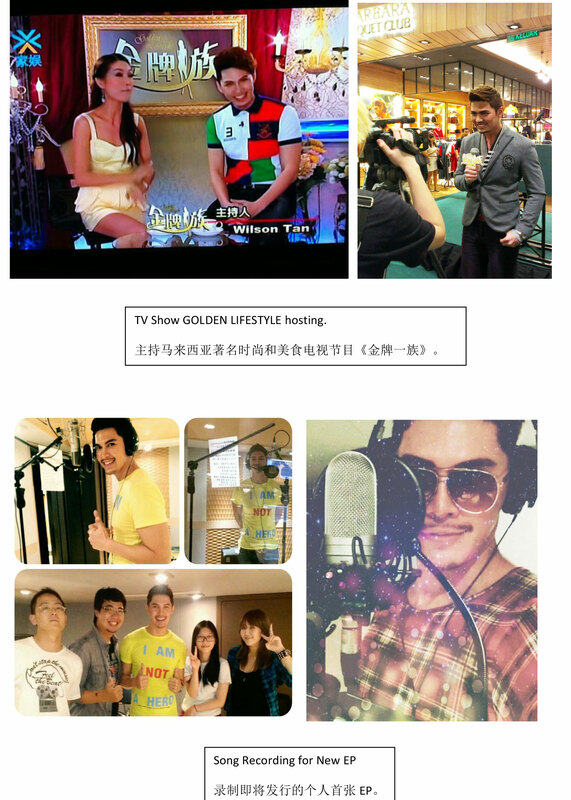 He was hosting for famous TV programme “ Golden Lifestyle “ in Astro 304 Channel. 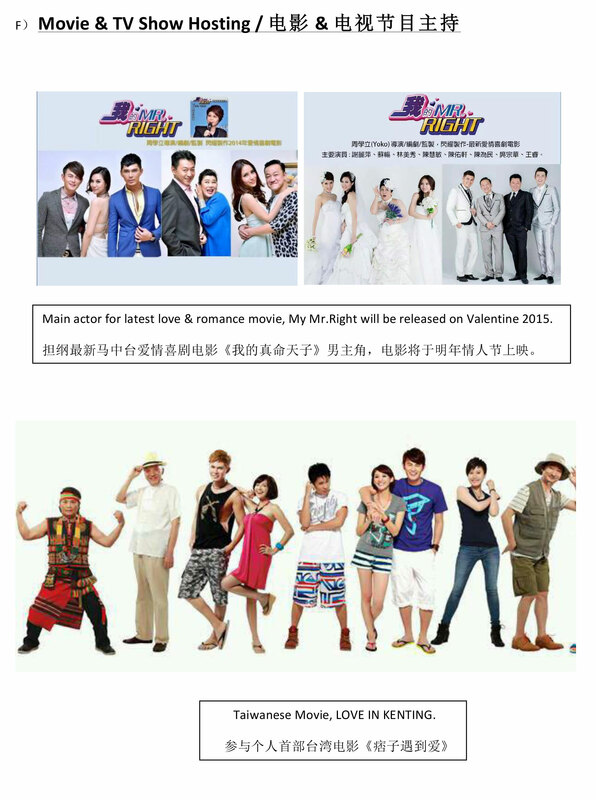 His first film was Love In Kenting which was shooting location at the beautiful beach of Kenting in Taiwan. He has just completed shooting his second movie, My Mr Right. Apart from acting, Wilson was also given the chance to contribute to the soundtrack of the movie which will be released next month. 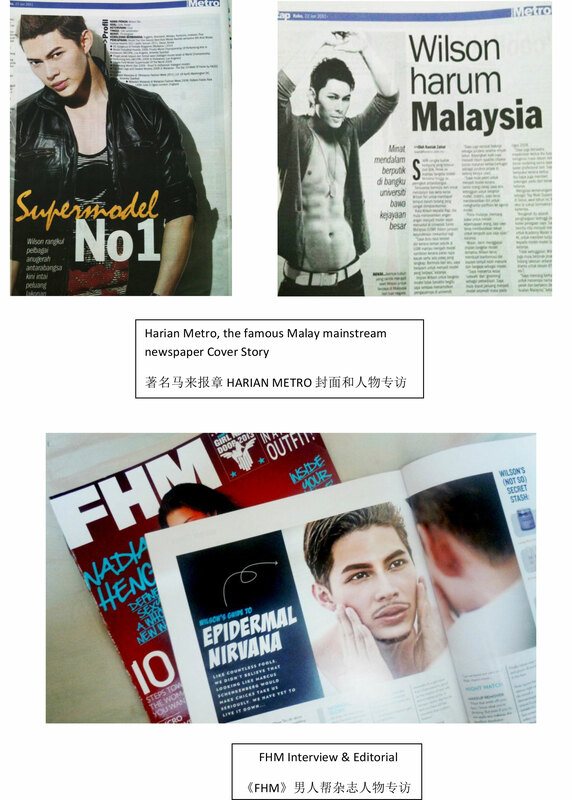 Never had a male model gained so much exposure in Malaysia in the past. 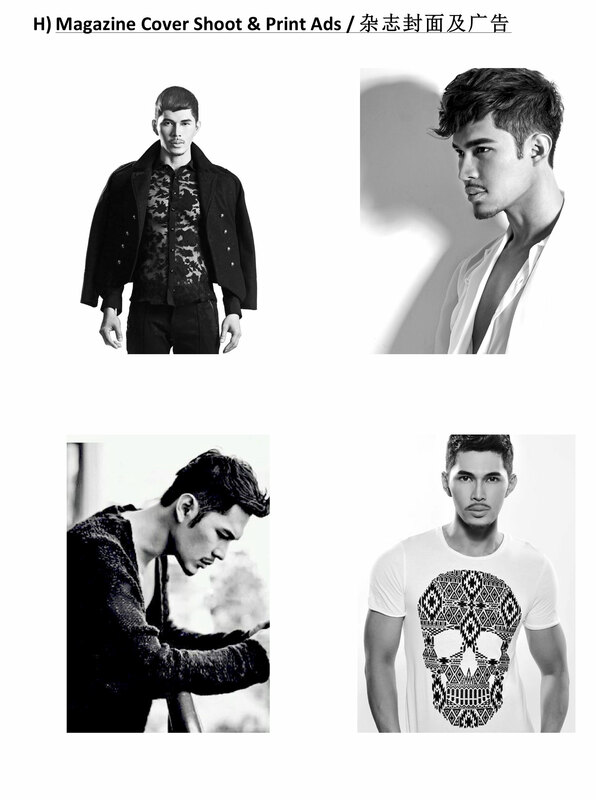 Wilson Tan is the only certified male supermodel in Malaysia from all the awards that he has won. Wilson Tan has devoted his 101% efforts in getting this far. He changed a lot of people’s perception along the way. He always believes in having the right mindset towards the goal which in the end will lead to something bigger like creating history and changing the future. Wilson Tan’s success has inspired a lot of people to chase after their dreams especially the youngster. With so many problems surrounding the teenagers in the recent years, Wilson Tan hopes to contribute something towards changing the attitude and behavior of today’s youth. He hopes to set examples and change their mindset into something more useful and positive without complaining about what they don’t have and focusing instead on the arrays of opportunities right in front of them.